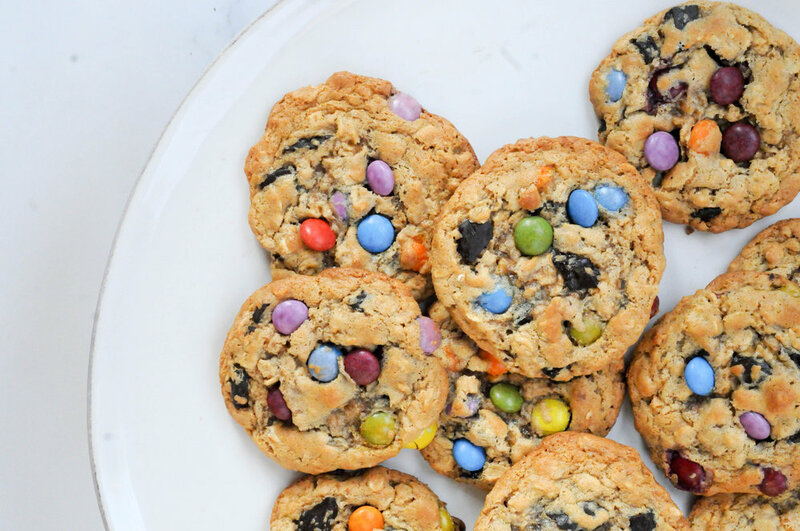 Flourless Monster Cookies — urban. apron. A monster cookie that is made with natural crunchy peanut butter and rolled oats. And one that is chewy, addicting and oh-so-good. Yes, please. Nut butter is your chewy-cookie-secret in flourless cookies. And it saves the day in this monster cookie recipe. If you didn’t know it was flourless… you couldn’t tell. But then again, my original monster cookie recipe only has 1/2 cup of flour in it, so in my opinion it’s not completely necessary in the first place. Perfect for those wanting a treat that is gluten-free. Or just those that want one less ingredient to worry about. In a mixer, beat the peanut butter and butter until smooth and combined. Mix in the eggs, vanilla and beat until combined. Add in the sugars and beat until smooth. Add the baking soda, salt and oats and mix until combined. Add in the chocolate and M&M’s until mixed in. Refrigerate the dough for about 30 minutes or until hardened and easier to scoop. This is especially important if your peanut butter is pretty drippy. Scoop tablespoon-sized dough on a cookie scoop and bake for about 9-10 minutes or until the edges are golden brown. Let cool on the sheet for 5 minutes before removing to wire rack to cool completely.